X-ray technicians are certified professionals responsible for using radiation to take images of patients to help diagnose problems. Most commonly working in hospitals and imaging centers, x-ray technicians, aka radiologic technicians, are part of a medical team. Math, science, and high-tech gadgets are all part of an x-ray technician’s day. If you’re wondering how to become an x-ray technician, how to choose x-ray tech program, and what happens once you’re working as an x-ray tech, please read on to find out the answers. X-rays are a form of electromagnetic radiation used in medical imaging, treating cancer, and even looking at the stars. X-rays were first discovered by a German professor named Wilhelm Conrad Röntgen in 1895. In 1901, Röntgen won the first-ever Nobel Peace Prize in Physics based on his discovery of x-rays. Because x-rays allow medical professionals to see inside the body, doctors can diagnose and treat medical conditions such as cancer, broken bones, blocked blood vessels, digestive issues, blood clots, and so much more. There are a many different x-ray tests available and which one used is dependent on the medical problem. A few examples of various x-ray technologies are computer axial tomography (CAT) scans, Barium enema, mammography, radiotherapy, and fluoroscopy. What's it Like to be a Radiologic Tech? X-ray techs, or also known as radiologic technicians, are trained professionals who use imaging equipment such as x-ray to view the inside of a patient’s body. Once the images are taken, they are used to help medical professionals in the diagnosis and treatment of any health conditions or injuries. An x-ray technician will get the patient’s information including their health history, and then explain what the procedure will entail while also answering any questions. Following the doctor’s orders, an x-ray technician will use the proper form of x-ray technology to take images of the patient’s insides. Once the x-rays have been taken, a radiologist will go over them and make a decision whether further testing is necessary, or potentially make a diagnosis if the issue is evident. More than half of the employed x-ray technicians work in hospitals. However, radiologic technicians also work in clinics, labs, and diagnostic medical facilities. Radiologic technicians daily job duties will often depend on where they work. X-ray technicians can choose to specialize through further education. 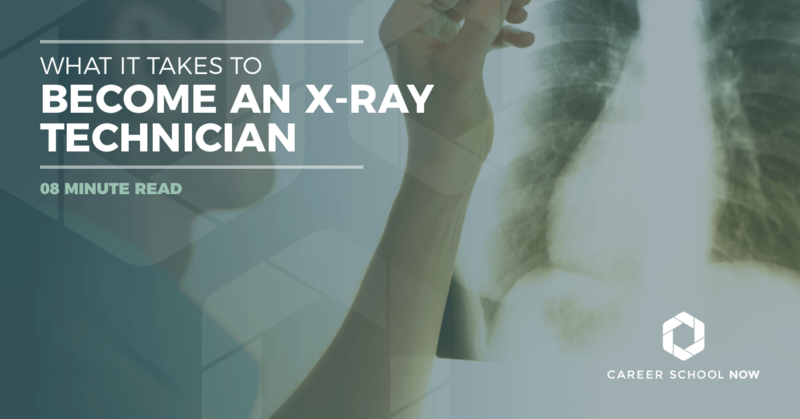 To be successful as an x-ray technician, there are some personal skills and qualities you should possess. Some of the skills can be fine-tuned with time so do not let a single one discourage you from chasing your dream of being an x-ray tech! Strong interpersonal skills: Your patients may be scared and in pain. It’s important to be able to keep them calm and explain to them what they’ll be doing while maintaining empathy. Being a people person benefits you if you’re an x-ray tech. Attention to details: A doctor will be giving you instructions, and it’s crucial to follow them word for word. Your attention to detail will also come into play when working with the patient; you may notice something that was missed. Mad math skills: There may be some mixing and administering chemicals to go along with the x-rays. Math skills are needed to get the necessary dosing correct. Physical stamina: Physical exertion can be part of the radiologic technicians job because patients may need help moving from hospital beds or wheelchairs. Standing for extended periods of time can be tiring so having the stamina to maintain this is important. Most skilled trades have a host of educational requirements. X-ray technician careers are no exception. To become a certified x-ray technician, you must have a high school diploma or GED and attend an accredited program. You can choose an area of studies such as radiography, sonography, nuclear medicine technology, or MRI’s. There are certificate, associate’s, and bachelor’s degrees in radiography programs available. Through all radiologic technology programs, you can expect courses such as medical terminology, anatomy and physiology, infection and radiation protection, patient positioning, and more. Many programs offer externships with imaging centers and hospitals where students learn more hands-on. X-ray tech programs should provide both classroom and hands-on learning. Certification programs are offered through hospitals and other healthcare facilities. These programs typically won’t provide any liberal arts courses which make them shorter in length than the recommended associate’s degree programs. The most common path to becoming an x-ray technician is an associate’s degree program. And, since January 2015, associate’s degrees is required, per the American Registry of Radiologic Technologists (ARRT). The associate’s degree does not need to be in radiographic studies but needs to be earned before entering a radiographic certificate program if this is the chosen route. The cost and length of school time of an x-ray technician program will be determined by if you’re going for a certificate or degree. Also, the price of an out-of-state college is higher than attending one in your home state. Most employers prefer x-ray technicians who have associate’s degrees, minimally. Most schools offer financial aid to alleviate the cost of x-ray technician school. The following chart reflects the approximate costs of x-ray tech programs throughout the United States. Most states do require their x-ray technicians to be licensed and certified and the requirements vary by state. There are also voluntary certifications available to x-ray techs who qualify. You MUST graduate from an accredited x-ray tech program to be eligible for licensure. Even if the state doesn’t require a license, most employers prefer those x-ray technicians who have been licensed. X-ray technician certifications are available through the American Registry of Radiologic Technologists. Get your x-ray tech license which is mandatory in all but 11 states. Licensing is through the American Society of Radiologic Technologists. However, some states offer state-specific licensing exams. Is the school you’re thinking of attending accredited by the Joint Review Committee on Education in Radiologic Technology? Find your school here. If you are in need of financial aid, then it is doubly important that the school is accredited. Find out the first steps to take to get financial aid here. Does the school prepare their students for the certification exam? Are classes flexible? Day, evening, weekend courses? Does the school offer real-world experience through hands-on learning? Are the equipment and the curriculum up-to-date? Do the credits transfer if you want to continue your education? Jobs for x-ray technicians will see a 12 percent increase through 2026. This is much higher than most other occupations, with the average growth being in the five to seven percent range. The population of the U.S. is aging which means there is an increase in medical conditions needs some imaging. In the meantime, while more Americans still have access to healthcare, there will be an increase in people visiting doctors and health care facilities, including imaging centers and hospitals where most x-ray technicians are employed. Radiologic or x-ray technicians earn a median annual wage of $58,440. This number is tabulated through a national average but could look different for every single radiologic technician. Entry level x-ray techs made $39,840 as of 2017, reports the Bureau of Labor Statistics website. The highest earners in the field of x-ray tech made more than $84,110.